Galax urceolata (Wand Flower) This very rare plant has wonderful, rounded, shiny leaves beloved by flower arrangers. These turn red / orange in winter. 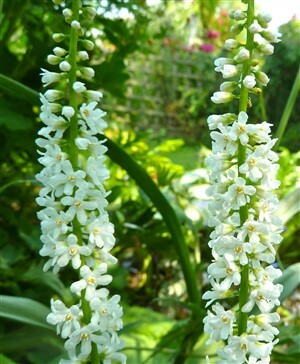 In late spring, foot long spikes of white feathery flowers are produced. For humus rich soil in partial of full shade. These have been in huge demand primarily by flower arrangers because the leaves last for such a long time without drooping and are so architectural. The plants take a while to get established and are slow growing but once going leaves can be picked freely as the plants spread.